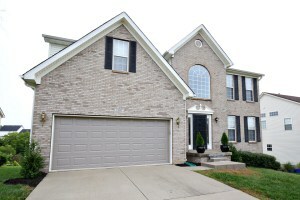 1107 Tindall Ln Louisville KY 40245 is a pristine four bedroom two and a half bath home in the Hills of Beckley Station. The dramatic two story foyer showcases hardwood flooring that flows throughout the first floor. The Living Room & Formal Dining Room display crown molding & lovely wainscoting. You'll love the Kitchen with abundant natural light, breakfast bar, pantry, and dining area. The stunning two story Great Room accesses the back deck and is accented by transom windows & a ventless fireplace. A half bath and laundry room complete the first level. The Master Suite has a private Master Bath with shower, jacuzzi tub, & dual vanity as well as a huge walk in closet. The second floor also contains three nice Bedrooms & a Full Bath. 1107 Tindall Ln Louisville KY 40245 has an amazing walk out basement with great storage space and area for future completion. The back yard is large with a sunny deck. The home also includes a two car garage. A couple of recent updates include new carpeting & fresh paint! Call 502-371-1173 today to discuss the property. We also invite you to visit the link above for basic property information or continue to utilize our websites to View Homes In Louisville! At Home In Louisville Real Estate Group will be hosting an Open House this Sunday August 31st from 2-4 at 353 Chenoweth Ln! Stop by to view this spectacular 4 Bedroom in Druid Hills! Just a few blocks from Brownsboro Rd and in a highly desirable neighborhood! The home is extremely well maintained with a fully fenced yard and koi point out back. 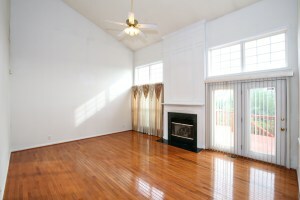 You'll also love the hardwood floors, bay window, and wood fireplace with gas logs! Beautiful and ready to welcome you home! Call 502-371-1173 for additional property information and visit Open Houses in Louisville KY for a complete list of all open houses in the area.! Come and join our team this Sunday for another chance to view 3516 Lisbon Ln, a fantastic 3 Bedroom ranch! You'll love the well maintained & tastefully designed interior. A few highlights include spacious bedrooms with hardwood flooring, large fully fenced back yard, one car detached garage, and new roof & triple pane windows in 2013! Wow! Click on the photo below for property details or call 502-371-1173 to speak to one of our Realtors in Louisville KY! We'd love to assist with your home search and give you a tour of Louisville Real Estate! It is that time of year again! The Kentucky State Fair is here August 14th through 24th offering an abundance of family fun with exhibits, rides, games, enticing food, & spectacular concerts! Admission is $10 for adults and $6 for children and seniors (cheaper tickets available prior to Aug 14th) and the exhibits are open from 9am until 9pm Sun-Thu and 10pm Fri-Sat. As usual, there is a great concert line up. Check out who is playing this year! Free Concerts at Cardinal Stadium: Beginning at 8pm for all concerts except for the Sunday Aug 24th which starts at 4pm. Be sure to purchase your tickets to the Kentucky State Fair and get tickets quickly for any of the main stage concerts you’re interested in! Which of these groups are you most excited about? What is your favorite part of the KY State Fair? Louisville is truly a wonderful city with entertainment and social options year round. Give us a call today for more information about Real Estate in the Louisville area and feel free to utilize our websites to view homes in Louisville! Join At Home In Louisville this Sunday August 10th at 1915 Deerwood Avenue in The Highlands! Only 1/2 block away from Bardstown Rd, the home is just full of character with 3 Bedrooms, 2 Bathrooms, and a fenced yard. Call 502-371-1173 today for property details about this wonderful piece of Louisville Real Estate or click the photo below for pricing. 1915 Deerwood Ave Louisville KY 40205 is a stunning three bedroom home in The Highlands! The home sits only a half block from shopping and dining along Bardstown Road! Enjoy off street parking and relax on the front porch. 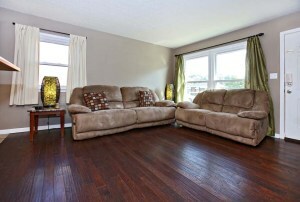 The front entry opens to a lovely Living Room with hardwood flooring and wood trim. 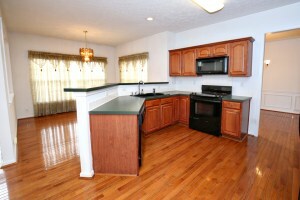 The Kitchen showcases granite counter tops, breakfast bar, comfortable dining area, and tile floor. 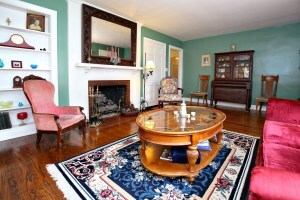 The Family Room has hardwood flooring & a handsome floor to ceiling stone wood burning fireplace. The Family Room also exits to the side of the home. The first floor Bedroom could easily serve as Master and is convenient to a Full Bath and Laundry Room. The second floor includes a spacious Master Suite with private Master Bath and another Bedroom. The cellar with exterior entry is wonderful for additional storage space. 1915 Deerwood Ave Louisville KY 40205 has a sunlit fully fenced yard with bubbling fountain, screened porch, and shed. Fantastic home in a highly sought after location! Call today for your private showing and let us give you a tour of The Highlands.